Architect Caliari is responsible for the design of this new Jaguar 24 Sport, produced by F.P. Yachts, a motoryacht realised to meet the standards of the Malta Cross class with the Bureau Veritas register. The contracts for several models have already been signed; the first unit is in an advanced state of production in the new production unit, the boatyard in Carrara. According to those in charge of the project, the boat has been born out of the intention to create an avant-garde product and of absolute reference in the world of pleasure sailing. The deep V- shaped hull has been designed to offer high performance and great sea- worthiness, maximum speed up to 49 knots depending on the engines, in maximum comfort and safety. Important performances, made possible by the adoption of propulsion with surface propellers or water jets and by a careful study into keeping its weight down. The interiors, which can be completely customised, offer the comfort and space typical of motoryachts; can be requested with 3 or 4 guest cabins, each with private bathroom, full beam owner's cabin with wardrobe and bathroom with separate shower, and a spacious galley. The area reserved for the crew is amidships with separate access to guarantee maximum privacy on board. The spacious saloon will have a dinette and dining area for 8 people as well as the corner bar. In any case the maximum level of personalisation in the layout and the interiors fully respecting the custom construction philosophy. The piloting position and wheelhouse have been carefully studied, on an ergonomic level, to offer top functionality whatever the conditions. 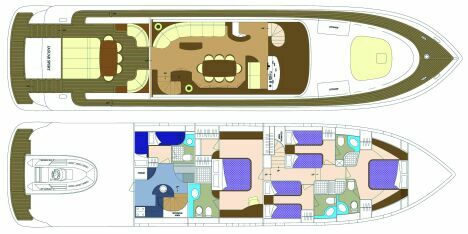 The cockpit is very large and equipped with a large sundeck astern, comfortable settees and a dining table for 8, which can be folded away. Astern there is also a garage for storing the water jet tender and if necessary, on the small bridge, room for a jetski. Among the "gems" that characterise the boat there is the Digital Yacht Control System that, via computer, using technology of military origin, controls all the systems on board, from the engines to the air conditioning, with infinite possibilities for expanding both the hardware and the software (from control via telephone to diagnostics of the system via satellite). Furthermore, those on board will be offered the extra input of well-being given by the application of the concept of domotica( * ) in the specific outline of the boat. The whole power system has been developed in this sense with innovative applications for pleasure sailing. For information: F.P. Yachts - via Menini, 2 - 55049 Viareggio (LU) - Tel +39 0584 388285 - Fax +39 0584 393911 - Web: www.fpicchiottiyachts.com - E-mail: info@fpicchiottiyachts.com.